Water…. 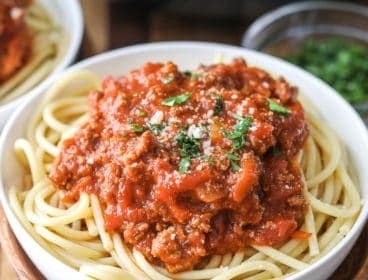 we ALL know we need more of this. All of us! To me water is.. watery.. it’s boring. It tastes like nothing. I have really really been trying to increase my water intake but in order to do so, I needed to make it taste good. How can you make water taste good? Everyone has put lemon in their water at home.. but it doesn’t do much for me! 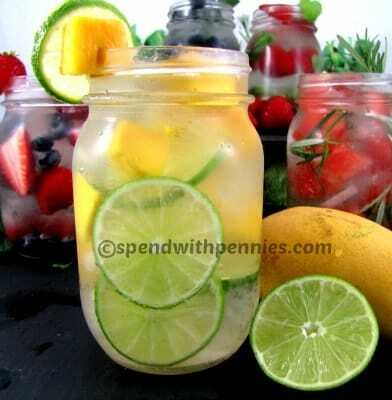 These Fruit Flavored water recipes are sure to help you get your full water intake every day! 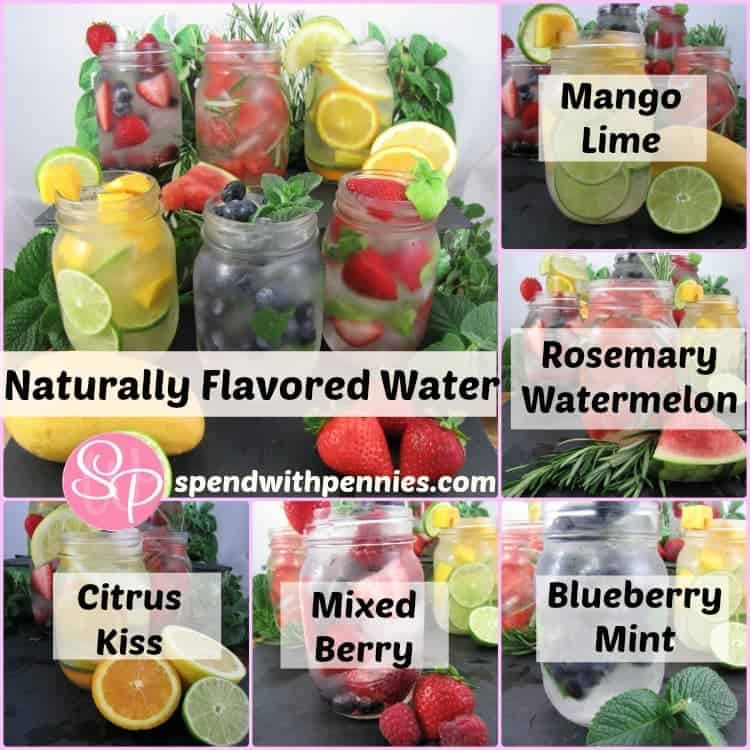 I have seen so many versions of fruit infused flavored water, Monica over at The Yummy Life has some of my favorites! 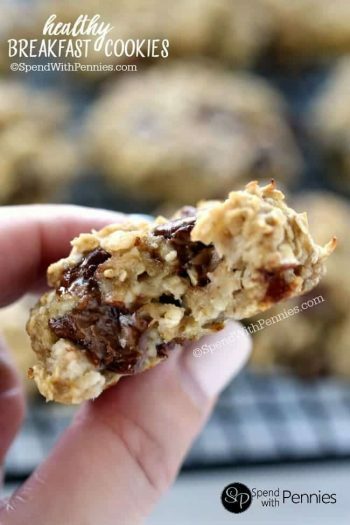 There are also great ideas found at 52 Kitchen Adventures & Nancy Creative! I decided to get my own creative juices going and come up with some of my own flavor combinations… not only has my water intake grown, my entire FAMILY drinks more water now! 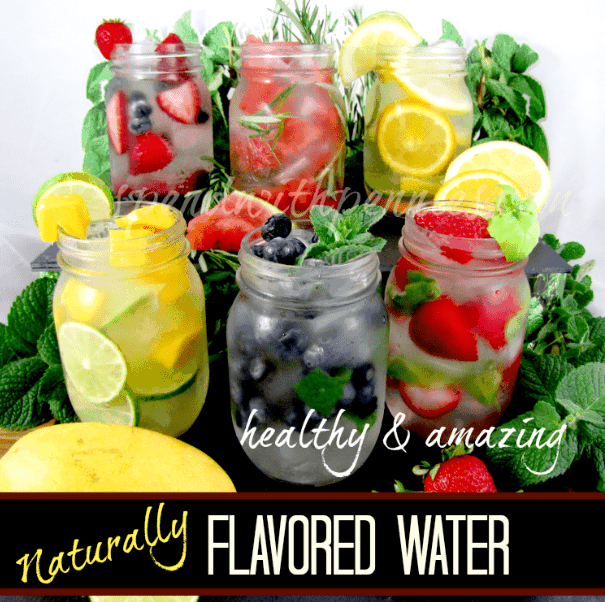 My girls love their flavored water and are very happy to have a glass of this instead of soda! These are NOT sweet drinks like lemonade, they just have a hint of flavors of the items you add! Each morning I’ve been filling a drink dispenser similar to this one with lots of ice, my ingredients and water! We set it on the counter and everyone loves it! The top two favorites are the citrus kiss mixture and the strawberry basil! It’s great to play with your own combinations! My next concoctions include blackberries, ginger, pineapple and oregano! I absolutely love this and the effects it has had on my family and I! Note: The citrus peel (lemon) can become bitter if left too long. 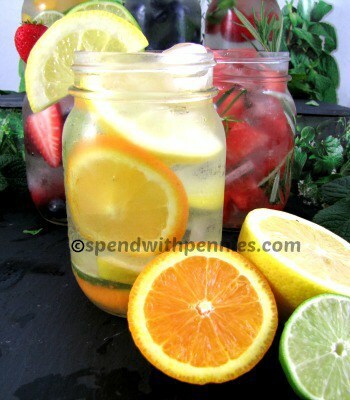 Once you are happy with the flavor of the Citrus Kiss water, you may like to remove the fruit. 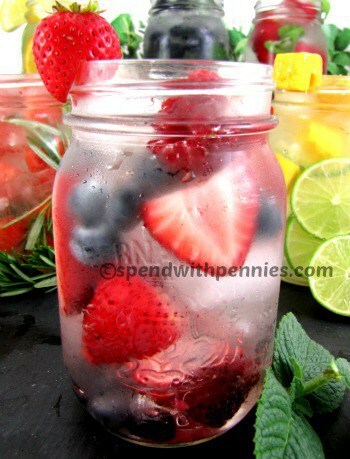 Place fruit and herbs in a large pitcher along with approximately 1 cup of water (no need to measure). Using a muddler or the end of a wooden spoon, slightly crush the herbs & fruit according to directions below to release the flavors. You don’t want to completely crush the fruit but if it gets a little smooshed (I think that’s a new word) that’s ok! Add 3 cups of ice and fill the pitcher with water. 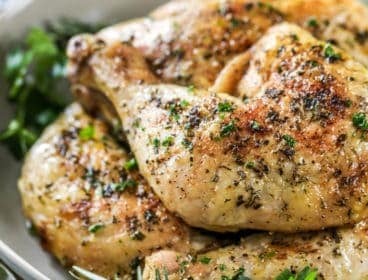 Allow flavors to steep about 1-2 hours and enjoy! •1 each lime & orange, ½ lemon, all sliced. •Muddle all ingredients, fill with ice & water and chill. •Muddle lime and ¼ of the mango slices. fill with ice & water. Add remaining mango chunks and chill. 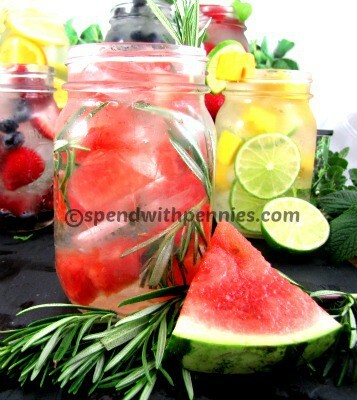 •Muddle Rosemary & ¼ cup of watermelon. Fill with ice & water. Add remaining watermelon and chill. •Gently and very slightly muddle blueberries, blackberries and/or raspberries. Add sliced strawberries. Fill with ice & water and chill. •Muddle Basil. 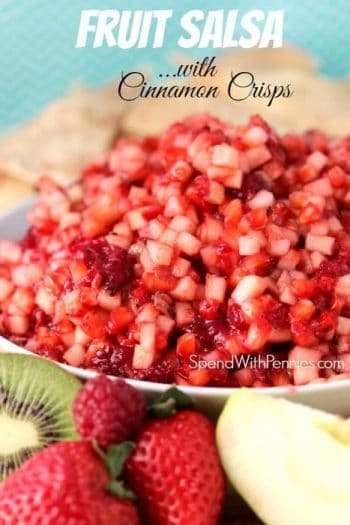 Add siced strawberries. Fill with ice & water and chill. •Muddle mint. Add Blueberries & very slightly muddle. Fill with ice & water and chill. My question may sound crazy but do you use peppermint, or spearmint?? I use whichever mint is readily available from the market or my garden :) I don’t have a preference. That sounds fantastic to me! I will have to try it too! I see this done in gallon jugs….these look like big mason jars….1st which? 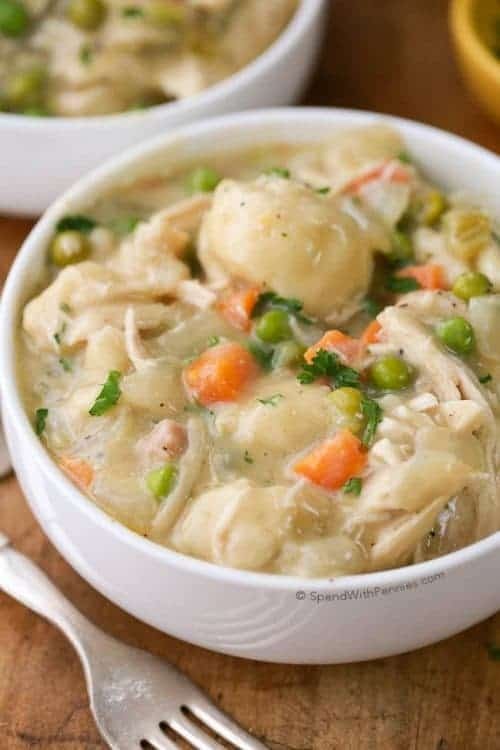 second, there is just my husband and my self….so if I make this will it last 2 days? or better to try and cut it in half? Never done before so any tips….to do or not to do would be greatly appreciated…..Thanks! 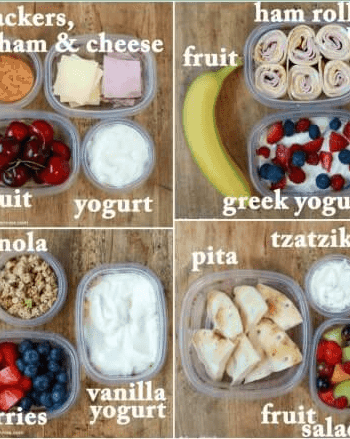 You can use any size container for this. Just add in you fruit/herbs and top up with water. Measurements do not have to be exact. I usually keep mine overnight but not much longer than that. 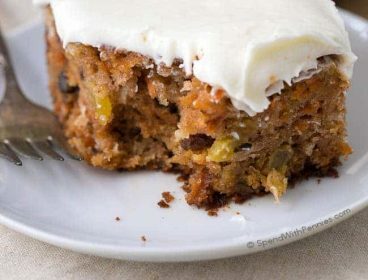 I agree with Lorrie, I tried a similar recipe with citrus. Made a gallon and wound up throwing it out because of the bitter taste. Peeling citrus works much better! We need to get you on a television….need a agent??? 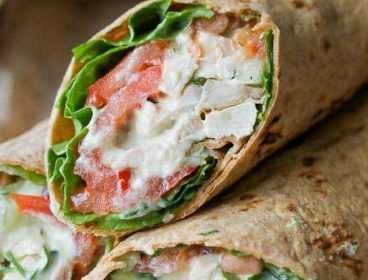 ?….i hav tried most of your stuff at home as well as with my clients i must say every thing has been spot on and real most important.Submitting to Rachel Ray and other’s…. can you do it with Sparkling water as well?? I HIGHLY recommend removing the peel of any citrus fruit used unless you like the bitter taste of it. I don’t and made the mistake of just cutting as in the photo. Frozen thawed fruit works equally well. Maybe better because it easily mashes down. Ya think if the fruit are out of season you can use frozen? I am on day 15 if no soda and this will come in very handy!! Thanks for sharing with us this week at Monday Funday! 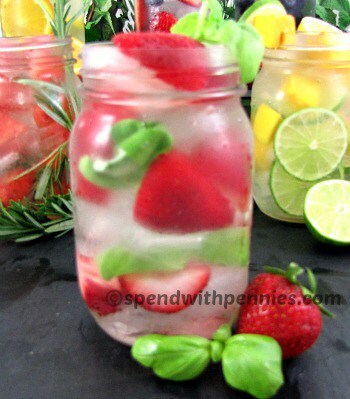 These are great refreshing water’s for the hot summer days. 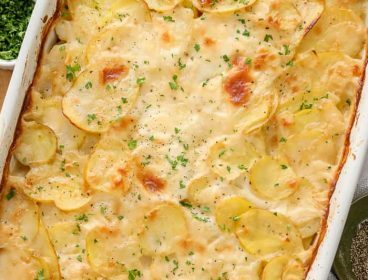 Thanks for sharing with Full Plate Thursday and hope you are having a great weekend! 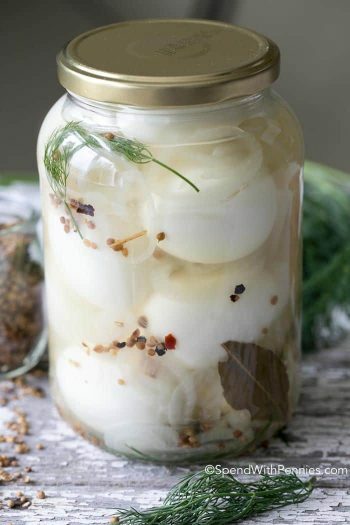 I pinned the photo of the jars of water-so appealing. Great post! Oh man I have never wanted to drink water so bad in my life! 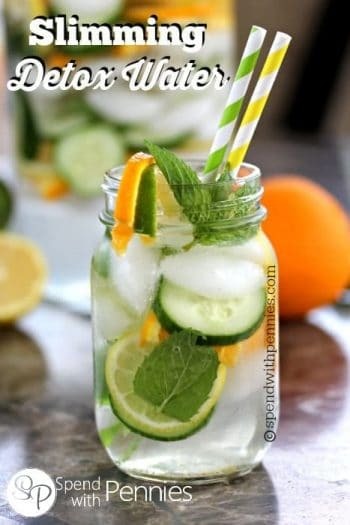 :) I have heard that cucumber water is good too but I haven’t tried it. Me too I absolutely love the refreshing flavor combination! 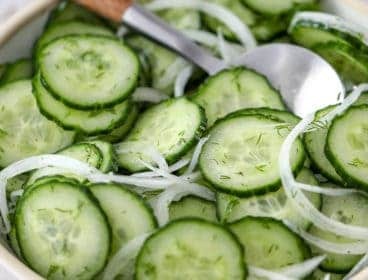 I tried cucumber & lemon water…the BOMB.com!!! lol…gonna try the rosemary Watermelon & Mango lime…sounds delish! 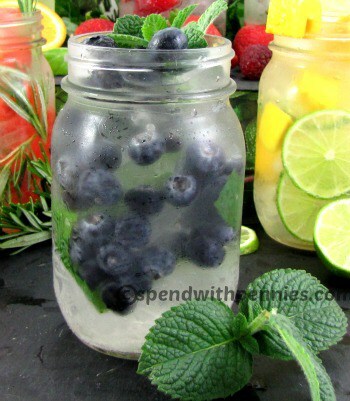 Such a great way to get your waters in! !